Brent and I (and a few others) were lucky enough to accompany Richard Norman from Massey Vet School out to sea off Wanganui this morning, to release a white-capped albatross which had been brought in 2 weeks ago with a dodgy eye. 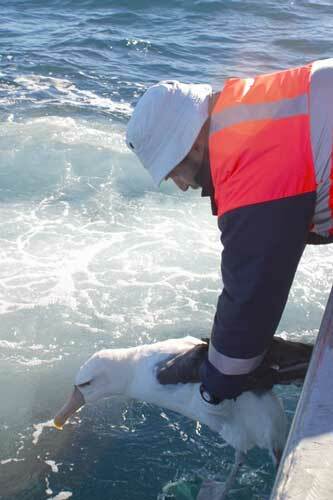 The Albatross release seemed to go well enough – about 20 miles off Wanganui, in a calm sea with virtually no wind. There were very few other birds to be seen – a dozen or so fluttering shearwaters, 3 more white-capped alberts, a little penguin, and 2 common diving petrels. It was a little surprising to note that the commonest pelagic bird was Cape petrel, with 7 individuals and a group of 6 seen. The boat skipper wasn’t at all surprised to see them, indeed he sees them regularly – but they are very rarely noted from the coast (e.g. only 6 Manawatu records) and I would have thought that such a distinctive bird would be seen more if they really do occur in reasonable numbers just offshore (?). There were 2 spotted shags on the jetty at Wanganui and (only?) 4 cattle egrets at the Wangaehu River Rd site.